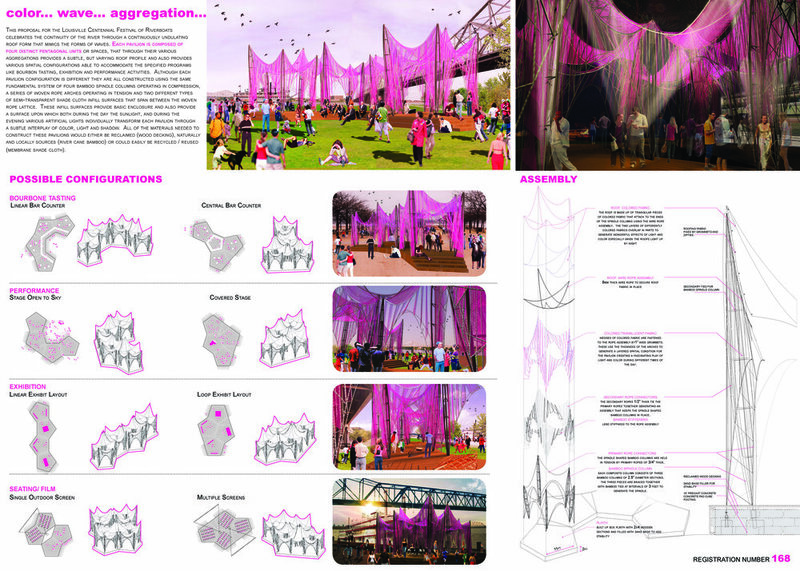 This proposal for the Louisville Centennial Festival of Riverboats celebrates the continuity of the river through an ecology of particpatory pavilions, activated through user participation. The pop-up pavilions are ludic activator of space thats obfuscate and flirt with the normative city and it’s more entrenched and codified forms of legislation. Each participatory pavilion is composed of four pods with pentagonal plans that permit various distinct organizations - linear, circular, and central layouts , that accommodate various programs like exhibitions, performances and theater. All of the materials needed to construct these pavilions would either be reclaimed (wood decking), naturally and locally sources (river cane bamboo) with a capacity to recycle.